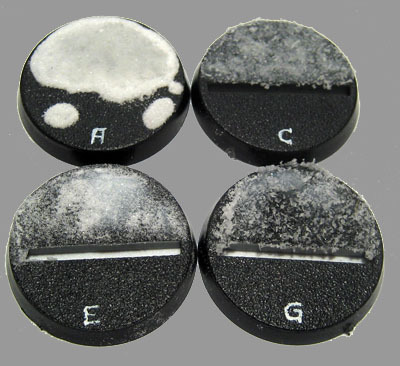 When I first decided to post about snow basing, there were a few scattered tutorials out there, but not a lot of step-by-step guides. Now there seems to be a glut of them. Rather than scrap my plan altogether, I decided to take a look at eight different ways to make snow. My goal is to show what a couple of material combinations can create without any additional tricks. To that end, I've used eight plastic bases that are unprimed and won't have anything on them other than the snow mix. for Kill Team on my new blog. 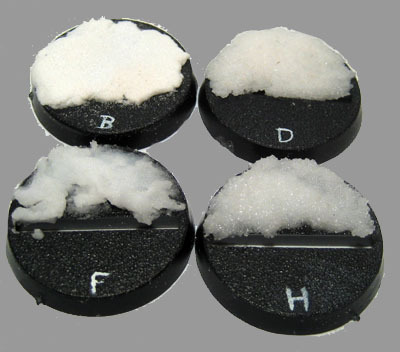 "Water Effects" and "modeling snow" are available from a variety of manufacturers. I've used a number of brands of "snow" and out of all of them, the stuff made by Woodland Scenics is my personal favorite. It also happens to be what comes in the Secret Weapon winter scenery kit which means I have a ton of the stuff lying around that I can use. There are two basic ways to add "snow" to your base. Dabbing the adhesive (PVA or Water Effects) onto the base and then sprinkling the snow material (bicarbonate or modeling snow) on top. Moving left to right starting on top, you can see I added the PVA, spread it out to cover the snowy part of the base, added liberal amount of bicarbonate and then shook the loose material off. 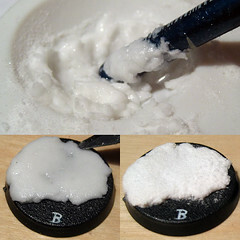 Mix the adhesive (PVA or Water Effects) and the snow material (bicarbonate or modeling snow) prior to applying it to the base. The mix ratio is really a matter of preference. If you want it to look a bit more wet, then use more PVA. Some people choose add a bit of off white paint to the mix for shading, but it's not something I do with mine. These two methods will cover you 99.9999999% of the time. You'll find a whole host of tutorials and opinions on how to apply it and which is best, so it's worth looking around to see what you like the most. Let's look at our results. The left column represents the First method (dab and sprinkle) and the right column represents the Second method (mix then apply). As you can see, we've got some radically different snow effects. The easiest and least expensive application out there. A decent effect for large numbers of infantry. An excellent way to create ice and slush effects. In my opinion... not the best result. An easy way to create slushy, recently fallen snow. This is also a nice touch if you're doing a diorama and want to add snow to vehicle tracks and footprints. An overall easy and effective application. This is by far the most common way to apply snow to models. The end result is very similar to bicarbonate, but the effect is a lot cooler and has a more muted finish. 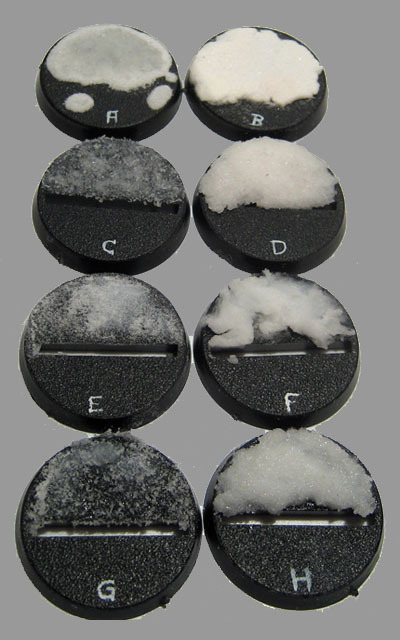 Modeling snow also has a more realistic crystal effect due to the nature of the product. The nice thing about working with Water Effects is that you can actually sculpt it to a degree and create drifts and impressions. With the bicarbonate, you lose some detail but you can fix that by sprinkling additional bicarbonate over the mix while it's drying and blow off the excess. This is my personal favorite. This creates a cold, wet looking snow that is hard to beat. 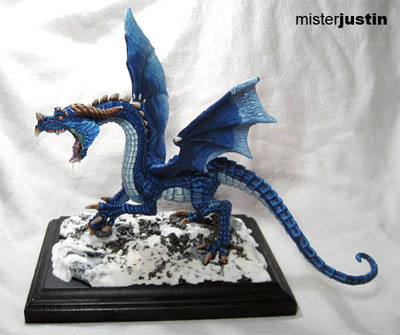 You can sculpt the Water Effects and if the result is too wet you can sprinkle some more modeling snow over the mix while it's drying and blow off the excess. And there you have it, eight different ways to create snow for entirely different effects. These techniques can easily be added to your base or scene and you can even combine more than one technique to create a variety of looks on the same base. Well, I've just bought some modelling snow to base my Dwarfs, and this has come at just the right take! Many thanks for your effort in writing it! Have you tried the GW stuff? How do you rate it? I've used the GW modeling snow and was happy with it. In case anyone else is wondering I've also used the GF9 snow, which you should also be able to find at your local nerd store, and that's good stuff too. Woodland Scenics is my favorite by virtue of the finished texture - but it's a minute thing and one you'll only care about if you have more than one brand of modeling snow on your desk. As an aside - the bases I used in the photos all had more than 24 hours to dry before the photos were taken. Any wet appearance is the result of the materials. This is a great tutorial. I like how it shows the difference that adhesives can make, I like the slightly darker/melty look given with the water effects. As a side note, do you find it useful/needed to give a wash, or a highlighting to the basing material afterwards? Xzandrate, I'm glad that you like the post. The Water Effects bases are my favorite too. I use the F and H techniques most of the time now. As far as washes go I have used a wash to create mud in vehicle tracks, and I've seen blood applied, but beyond creating an ADDITIONAL effect there's no need to do anything to the snow. If you're only after snow this should be the last step on the model. I use PVA and sprinkle with the Woodland Scenics Snow basing material. I found that I get significantly less "slush" effect by first painting the snow area with Skull White prior to the PVA step. @Master Darksol: painting the area beneath the snow can make an incredible difference. For this post I wanted to show the finished results without any additions. You can put the snow over painted gravel, rock and other effects or terrain though to get different winter effects. Those were done with method H right over the finished rock. In the thinner spots you can see the rock colour right through the snow and it's a great effect. Snow is, without question, my favorite modeling effect. Don't forget that a white undercoat can help the overall look of the snow. I'm using white paint and baking soda on my Space Wolves, and it's held up wonderfully. It is hard to beat Woodland Scenics snow. You get so much more compared to all the gaming companies little tubs. I'm thinking of doing some Ultramarine Scouts with snow bases and method B looks perfect. 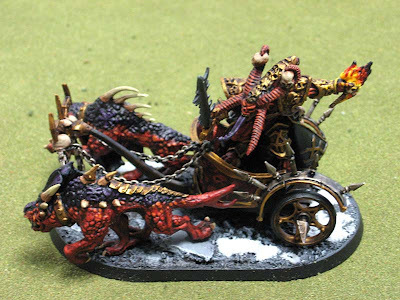 H looks like the best to use for track marks on Scout Bike bases or to show the heat from a LandSpeeder Storms engines! I love posts like this that give you useful info to realise intersting ideas. I am using snow on my BA, but I have to say I prefer Gale Force 9 to the GW snow. Unfortunately I only own GW snow right now. Placing an order soon so I can get cracking on this. If you can get your hands on some try the Woodland Scenics snow. It really is a superior product and you get a lot more for about the same price as the GF9 proudct. 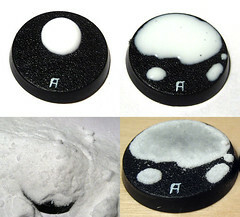 Alternately check out my "Instant Scenery Kit - Winter" which comes with some of the Woodland Scenics "Soft Flake Snow" as well as other winter themed basing materials also at a similar price point. While the GF9 and GW products are decent materials you simply don't get enough product for the price. Which brand of water effect did you use? I know this is an really old post but I am courious if the Baking soda has yellowed? And did you seal it with any spray varnish? Roumor has it that the baking soda might become yellow, but other roumors tell about the matt varnish yellowing up. What has been your experince? Anon: Good question. Let me see what I can find out from some folks. I don't have any bases to look at in my display case that have snow on them to see what has happened over time so I can't say for sure.